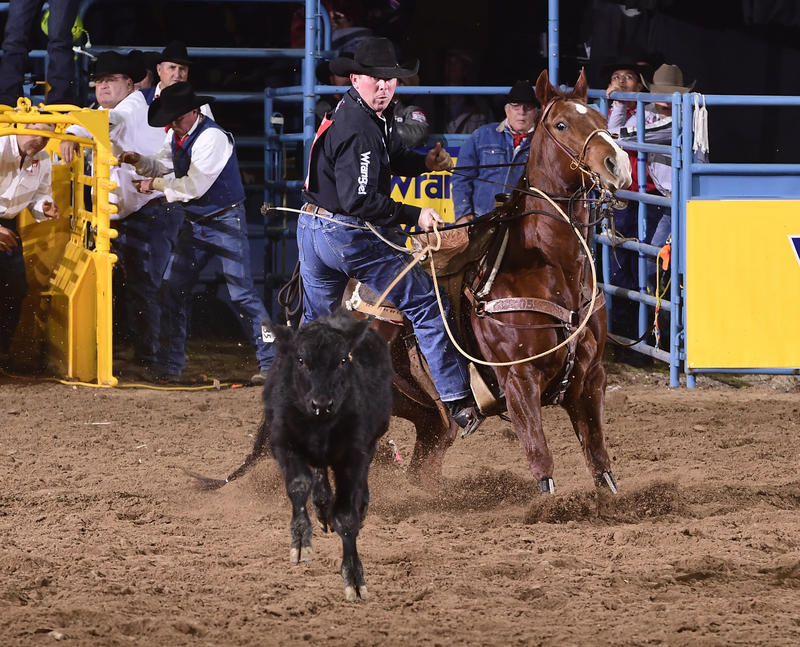 LAS VEGAS – It didn’t take long for tie-down roper Ryan Jarrett to keep the ball rolling. One night after winning a share of the fifth round at the National Finals Rodeo, Jarrett was back at it Tuesday, roping and tying his calf in 7.8 seconds. That finished in a tie for second place in the sixth round, worth $18,192. It was more than decent; it was important. Jarrett suffered no-times in the first three rounds, then was just off the pace for placing among the Top 6 on the fourth night of ProRodeo’s grand championship. The last two rounds, he has pocketed $39,000 and pushed his 2018 earnings to $126,616. He has also moved up from 15th to 11th in the world standings. That’s the goal in rodeo. Not only does money help make ends meet, but it’s also how championship points are tabulated. The contestants in each event with the most money won at the end of the season will be crowned world champions. He knows a little bit about that; he won the all-around title in 2005 during his first trip to Sin City. That’s a good thing, because the family is changing. He and his wife, Shy-Anne, are expecting a baby girl in February. He needs every dollar that Las Vegas can give him just to make sure she has all she needs. “It’s about 60 days from now, and I’m excited and nervous a little bit,” he said. “We are getting the house prepared for a little one running around in not too long. We will see how the diaper-changing goes.